Sakaya Restaurant & Bar is the wonderful place for you to enjoy food in Ninh Chu Beach. This is the restaurant & bar belongs to Bau Truc Resort. It is located far from Phan Rang Thap Cham City about 5 km. 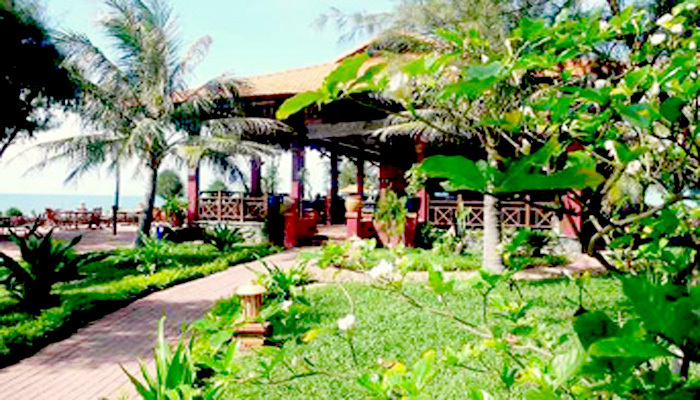 The restaurant is not only the place to serve tourists who stay in resort for their beach holiday but also the place for all who love the good food in this area in Phan Rang Thap Cham City. Sakaya Restaurant is the open area. It is located in the Sakaya Area in Bau Truc Resort. The restaurant is wide enough for the big events and crowded party. There are the inter space for whom who love the warm place and the outer space that close with the beach for whom who love the open space. The restaurant will set up the table base on your request such as the space, number of guests, the scale of the party, purpose. It is very easy for you to choose the suitable area for your romantic dinner or the warm dinner for your big family or the joyful atmosphere for a big group you have. Sakaya Restaurant offers you the rich menus with different type in serving. The delicious dishes are seafood with lobsters, shrimps, crabs, fishes in different cooking ways. You can find here Vietnamese traditional dishes or local dishes that you love to taste. Beside the rich menus in which there are dishes cooked in European and Asian style are served. There are two ways to be sure that you have a good time enjoyed your food here. You can ask the restaurant for consulting before choosing any menus base on your finance that you can pay. Or you can have the level of menus’ price and decide to choose one of them to ask the restaurant can prepare. Each way brings the suitable price that does not make you to be bothered. Ask first for your reference then choose the thing suit for you your situation.